Gaslighting is a horrible form of psychological manipulation and control. It's characterized by a manipulator causing a victim to question their own judgement, memory and sanity. Gaslighting is a threatening phenomena that can happen both in personal relationships and in the workplace. It can have severe consequences, especially if it continues over a long period of time. 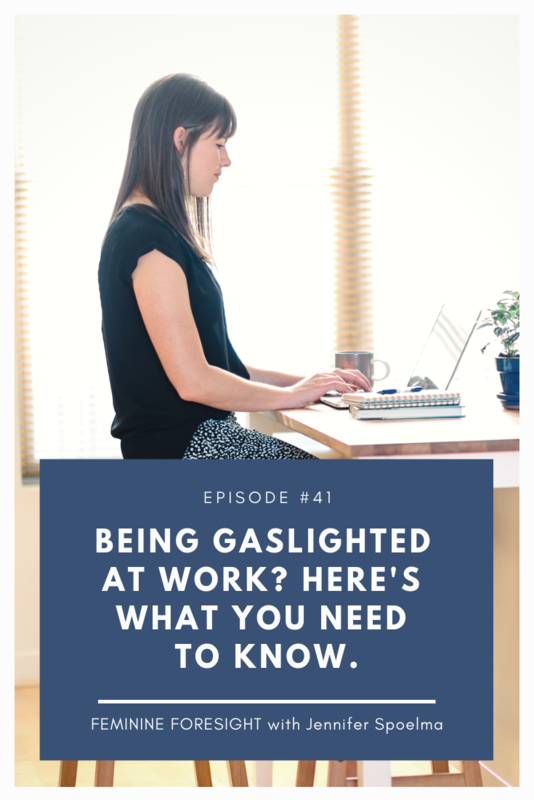 In this podcast, we dive into what gaslighting is, where it comes from and how to deal with it in the workplace. In this episode, I challenge you to LET GO of the cultural story that tells us women are overly emotional, irrational or too sensitive. And instead, I challenge you to EMBRACE the story that as women, we are wise and intuitive. 2:16 Where the term “gaslighting” originated. 3:30 The story I’m challenging women to leave behind in this episode. 5:50 Signs of gaslighting. If you notice these thought patterns in yourself, you may be a victim of gaslighting. 7:40 How gaslighting typically occurs at work. 10:00 A personal story about gaslighting in a boss/employee relationship. 14:00 Communication cues to look for to identify gaslighting. 19:50 How to deal with people you believe are gaslighters. Head on over to Instagram to share your thoughts on this episode. Tag me in your posts and stories so I can follow along!